The Market Porter is an old historic pub on Stoney Street where you can get a range of different ales and beers on tap. Do you work at Market Porter? What did you think of Market Porter? Market Porter is an excellent venue with a usually great selection of guest beers. Alas, it is all too often let down by people drinking at the bar who make it difficult, especially at busy times, to see what is actually on offer on the pumps - and when asked politely to move aside they do not show any consideration. Am not sure either why in this day and age smoking is still permitted at the bar. Market Porter is still the best pub around by far - but it could be much better without too much extra effort. 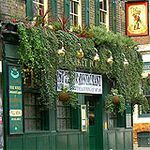 The Market Porter is amongst the very best pubs in London! It has excellent service and good pub food. The only downside at the Market Porter is that, even with the recent extension, it can become very busy! The Market Porter is a traditional, old English pub with a cosy atmosphere. There is an excellent range of real ales appreciated by the wide range of punters. The Market Porter is a real, welcoming, proper pub and the bar staff are ok too. Be sure to try a real ale. Walking around Borough Market in this cold February afternoon, me and my best friend started feeling a little hungry, in fact, all the delicious smells of the nice cooked food from the market enhanced our appetites and wanting to get away of the freezing wind and stay warm we decided to give the lovely street food a miss and go eat somewhere indoors. And there it was, The Market Porter. We got in and as you expected on a Saturday lunchtime the bar was full (I think there was a football match on), we were almost leaving when I spotted the sign 'Dining rooms upstairs' and what a pleasant surprise, not only we got a table straight away but it was next to the fireplace. The dining room couldn't be more different from the downstairs bar, it was cosy, warm with a homely feel. The choices of food were compact but the perfect pub grub mix, from burger, pies to fish and chips - 'belly-warming' and unpretentious and more importantly all the ingredients came from Borough Market. I ordered the fish and chips which came with a generous portion of chips and peas, the was fish super fresh and batter light and dry (not oily) - 10 out of 10. My friend ordered the burger, a thick sized patty with also came with a generous portion of chips and salad. I had a chance to try a bit of his burger and I'd say the patty was seasoned to perfection, and you clearly could taste the high quality of the meat. Excellent choice for a Saturday afternoon, if you want a quiet and cosy lunch. Definitely almost a hidden gem. 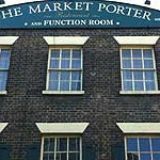 The popular Market Porter’s fame among real ale aficionados predates Borough Market’s current ascendancy as a specialist foodie haven but it’s still holding its own among the increasingly beer-aware pubs and bars of Southwark. This traditionally styled pub, often draped in attractive hanging baskets in season, stands on a street corner site right opposite the market buildings, and retains its special early market licence. Indoors a vast collection of pump clips decorates the dark red and polished wood decor. The space around the horseshoe bar is optimised for vertical drinking, with a few old barrels around the walls, while a small and slightly brighter extension at the back offers tables and chairs. A small restaurant area occupies the first floor. There’s no outdoor seating but you can drink on the street outside. The reason the main bar is so sparsely furnished becomes immediately obvious if you visit at peak time: the place is frequently packed to the gills with people spilling out onto the streets. The quietest time is perhaps mid-afternoon on a day the market is shut. It’s a really mixed crowd: local workers and residents, market stallholders and customers, those meeting up before a meal in one of the nearby eateries and a good proportion of dedicated real ale fans attracted by the dazzling range (see below). Those wanting to sit down and eat can escape to the contrasting peace and quiet upstairs. Although not especially known for its food, and with plenty of local competition, the pub offers reasonable daytime pub grub. Pies, sandwiches, pasta, scampi and the like can be ordered at the bar with prices for main dishes around £7-£9, while upstairs some more elaborate options like mixed grill, pork belly, smoked salmon and steak and ale pie can be had for £8-£15 with table service. Twelve cask ale handpumps line up on the bar: one of them dispenses Harvey’s Sussex Best, but for the rest the policy is to rotate through as wide a range of different beers as possible, with around 50 different brands on sale over the course of a week. The pub favours small and obscure breweries over the better known brands and they’re drawn from all over the UK, with a good proportion of special and seasonal beers. There’s a few craft kegs from BrewDog and Meantime, plus Belgian strawberry wheat beer Früli, and a few wines and other drinks too, though they’re a little beside the point. There’s always something of interest and the rapid turnover ensures freshness, but there are disadvantages to the incessant pursuit of novelty – you’re left wondering quite what it is you tasted last and great beers you might want to resample rarely return. Staff are rarely relaxed enough to give advice and information, and making your choice usually involves attempting to peer over several sets of shoulders at the pump clips – a board displaying the current ale selection in a prominent place would be a quick win. 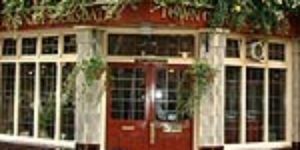 The pub doesn’t offer the most comfortable and relaxed of pub experiences in the area: for a more limited choice of real ales in less frenzied surroundings you’re often better off in the Southwark Tavern or the Wheatsheaf nearby. But the Porter remains unique, an essential call both for real ale hunters and those seeking out London’s most remarkable and characterful pubs. Avoid this pub unless you like rude managers and disgusting toilets. The sanitary bins were overfull and all over the floors and the smell made me feel sick. My husband said the mens toilets had faeces all over the seats. I asked to speak to the manager to let him know and was told "its the fault of you women!" We obviously wont be going back! What an enjoyable pub. My husband and I visited 5OCT08. We didn't eat so I can't say about the food. But the ale was good and the bartenders and patrons friendly. We will definitely return on our next visit. This is almost the perfect pub - great selection of beers and ciders, and all reasonably priced compared with other pubs and bars in the area. Plus, when standing outside it's easy enough to wander over to the market to get something to eat. The one downfall is the staffing - I frequently visit on a Friday evening when they often only have two staff at the bar, which is clearly not enough for such a popular pub in a popular location. Also, I often find that regardless of who actually approached the bar first, females will often be ignored whilst males are served first - yes, even by male bar staff. It's amazing that no one has posted a review since the latest refurbishment at the Market Porter. It now has 10 beers and a cider on tap. The Market Porter is practically always packed out despite its increased size. The Market Porter is the best pub in the area. Magnificent selection of beers - the bearded CAMRA types paradise! Sports fan friendly with SKY & Attheraces for the punter that wants a decent pint while losing his money. Food not gastropub but at the top end of its genre & plentiful.